Lockhart may be tidy, but it is also dying. The cafe and the picture show are both for sale. 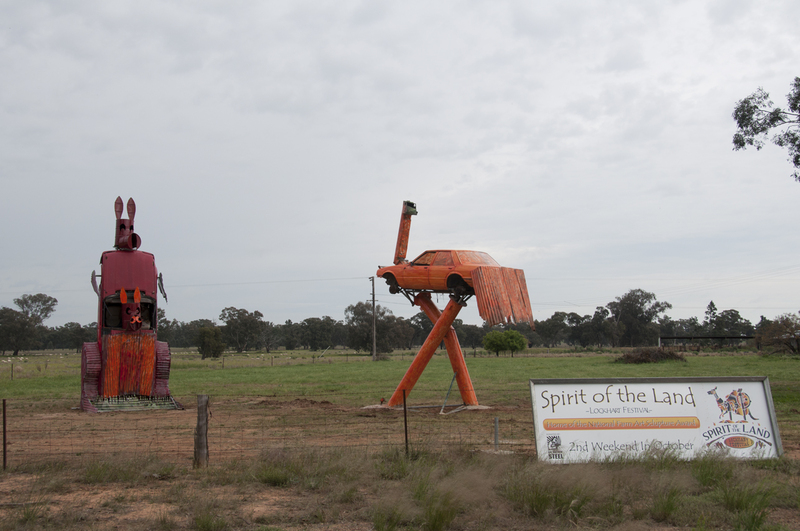 A few weeks ago, at the Muddi Markets in Wagga, we talked to a woman (Trish) at a booth advertising the Spirit of the Land Festival in Lockhart. One of her best friends lives in Canada, so we had a good chat. The festival looked very interesting, and when we realized it was only an hour’s drive from Wagga we immediately put it into our calendar. And today, we went; and yes, we saw Trish there. And every year from here on in, we will go again: it was spectacular! 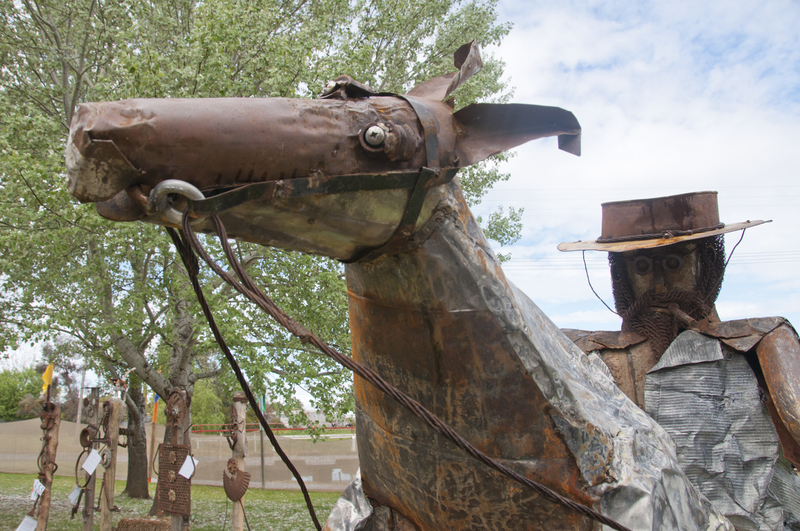 The Spirit of the Land Festival is a festival of farm art – and not just any art, but specifically farm sculpture. 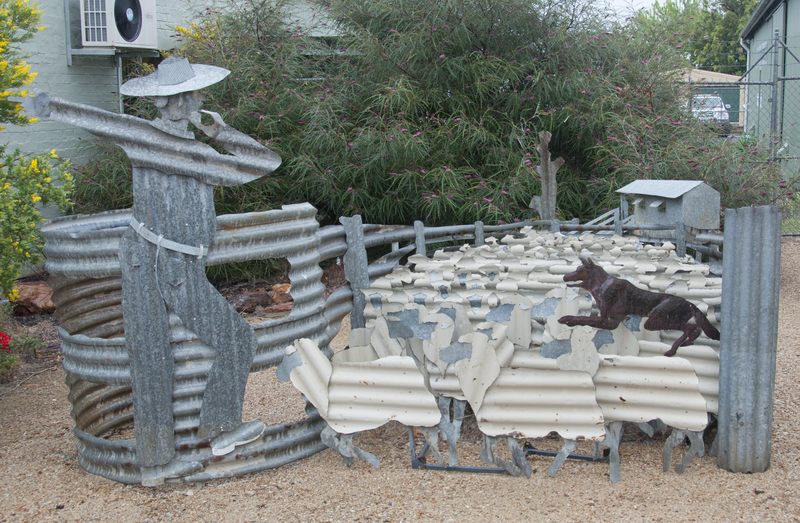 Up for grabs is a $10,000 National Farm Art Sculpture Award prize. 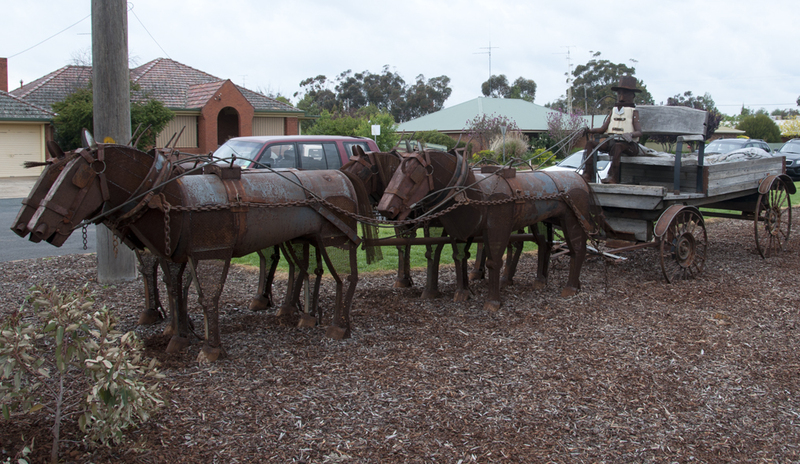 The festival admission is $5 per person, which gets you into the sculpture garden at the caravan park (what a fitting venue!) and two halls with some Aboriginal painting, some basic landscape painting, a bit of small sculpture, some wonderful cardboard box art from kids in schools in the Riverina, that type of thing. There is a street market for free all weekend. And there was the Doris Golder Gallery…more about that at the end of the post, but for now we will say that the additional $5 each to get in (museum, not part of the festival, and one of Lockhart’s only year-round attractions) was money well spent on the trip. 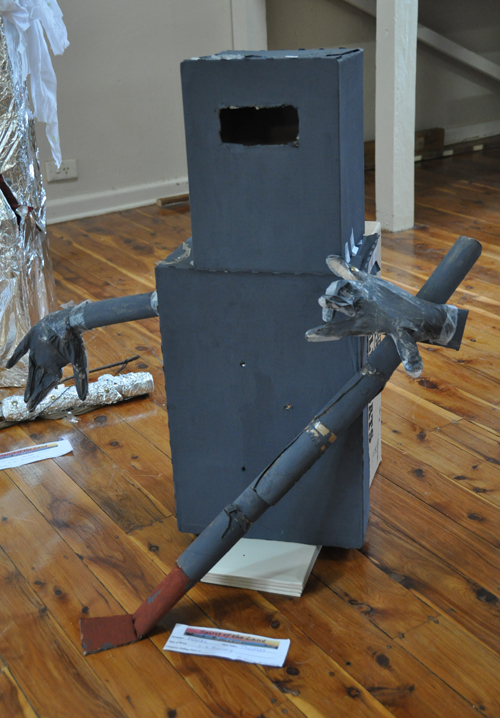 There was an entire room of 'totems' built by school kids in the Riverina area. Some of it was absolutely stunning. Hopefully they will go on to learn to weld. It started to rain just as we got to Lockhart, so we looked at the indoor exhibits and the street market, which was mostly covered as are most sidewalks (sorry MO…footpaths…) in this part of the country because of the sun. The market didn’t have much, but we did buy 6 grapefruit for 10 cents each and 6 of the biggest lemons we’ve ever seen (they are bigger than the grapefruit) for $1. And we thought we had gotten a good deal at the Wagga farmers market the day before when grapefruit were 3 for $1. Then, just as we left the Doris Golder Gallery (where we were given 6 oranges, for free!) the sun came out and we had perfect weather for the sculpture exhibit. The sculpture exhibit was beyond description. There was a huge range of sizes, of styles, and of materials. Pretty much the only common element was that it was made of junk. Old sheet metal, corrugated tin, lawn mowers, wrenches, gears, some wood, rope…you name, if you can find it laying around somewhere on a farm or, as one guy pointed out, the side of the road, it was incorporated into the art. In the artists’ bios, there was also a theme of this being a therapeutic art quite often: with the drought in the Riverina for the past decade, a lot of farmers were destitute. To provide support for them, many of the towns opened a ‘men’s shed’ – literally a shed where farmers could get together and talk and just have a bit of camaraderie. It was at these sheds that many of them learned to weld and got creative with the junk around them. The themes, however, ranged from rural to mythological to whimsical. Some of it was absolutely amazing, some of less so, but all of it interesting if not aesthetically then just for an insight into a part of Australia that very few people see. But, oddly, a part of it that is pretty big in its own right. The Doris Golder Gallery is in the museum in Lockhart. You have to love the address on the sign: near the clock! Might be hard to find if Lockhart wasn't so small (or if the sign wasn't beside the gallery, under the clock). And the 2012 Spirit of the Land Festival is on October 13 & 14 – anyone thinking about coming to visit next fall (Canada) or spring (Australia), try to work those dates into it. You won’t be disappointed. We took a whole lot of photos of the sculptures (and more of the kids totems); they are at the bottom of this page. But first, back to Doris Golder. 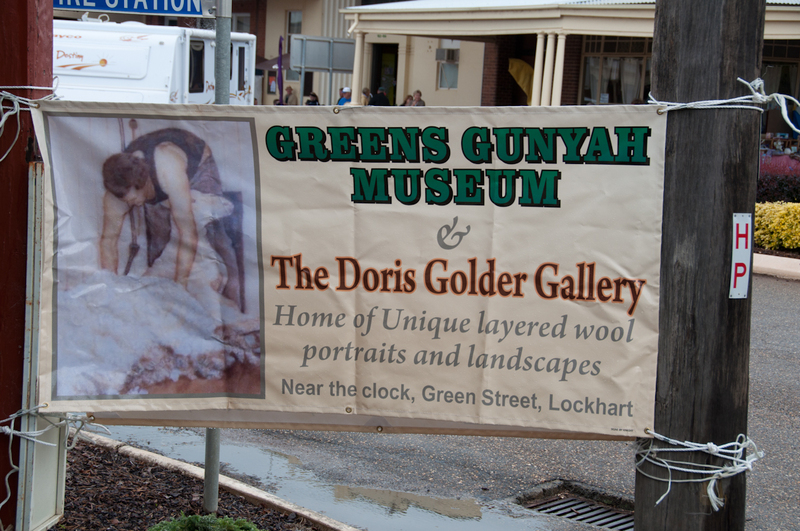 Doris Golder is a portrait and landscape artist from Lockhart who works in wool. Yes, wool. Not watercolour, not acrylic, not ink…wool. Here’s what she does: She starts with a photo (not taken by her; often, something that has inspired her in the newspaper). Then she glues a layer of pure white (not dyed, but natural) wool onto a board, and draws an exact replica of that photo onto the wool in pencil, shading it in grey scale. Then, here’s where it gets both wacky and amazing, she lays bits of wool of various shades (again, all natural, no dyes) onto that sketch to make a version of it in wool. This top layer isn’t glued on; it is just held in place by the glass in the frame. It is…it is beyond belief. 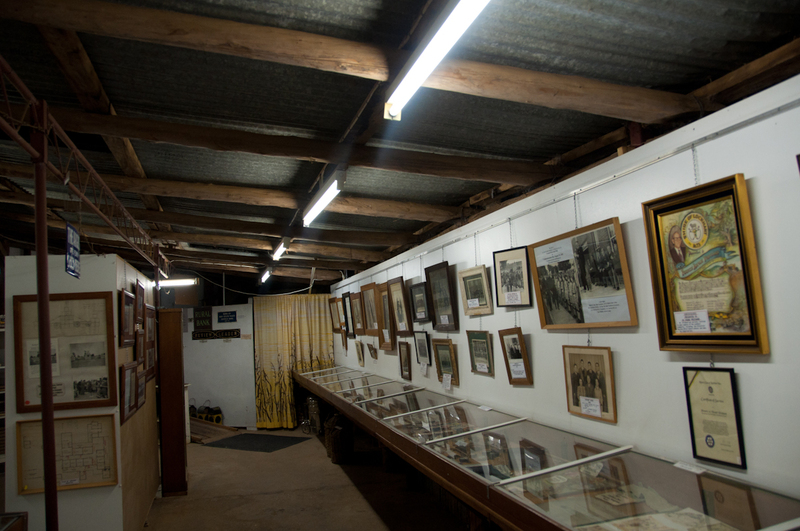 Probably a curator's worst nightmare, the Green's Gunyah Museum is a tin shed with no climate control and a whole lot of spiders. No architect could design a better building for what is housed in it. Sure, it is cheesy, but it is fascinating. 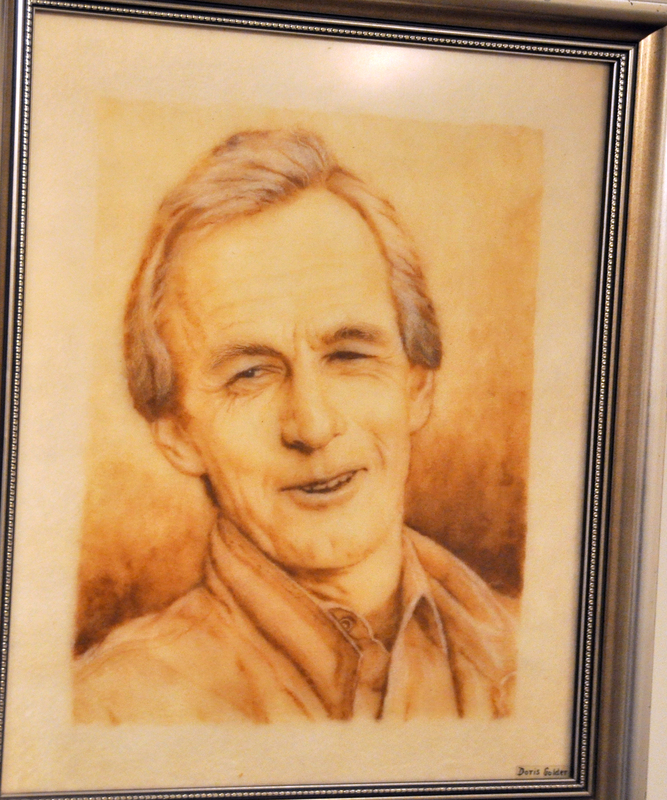 Subject-wise, there are portraits of everyone from Rupert Murdoch to Greg Norman to local politicians; there are pet portraits; there are landscapes. And then, because Lockhart is in the middle of sheep country (the area was settled as a 480,000 acre sheep station), she also did pictures of sheep. You can’t help but laugh at a woolen picture of a sheep, then laugh harder at the picture beside it of a sheep being sheared. So, along with the sculpture and totem photos, there are a few of Doris Golder’s pictures too. Please click on them to see enlarged versions. You know you are almost in Lockhart when you pass these on the highway. You can't miss a kangaroo (with a joey in its pouch!) 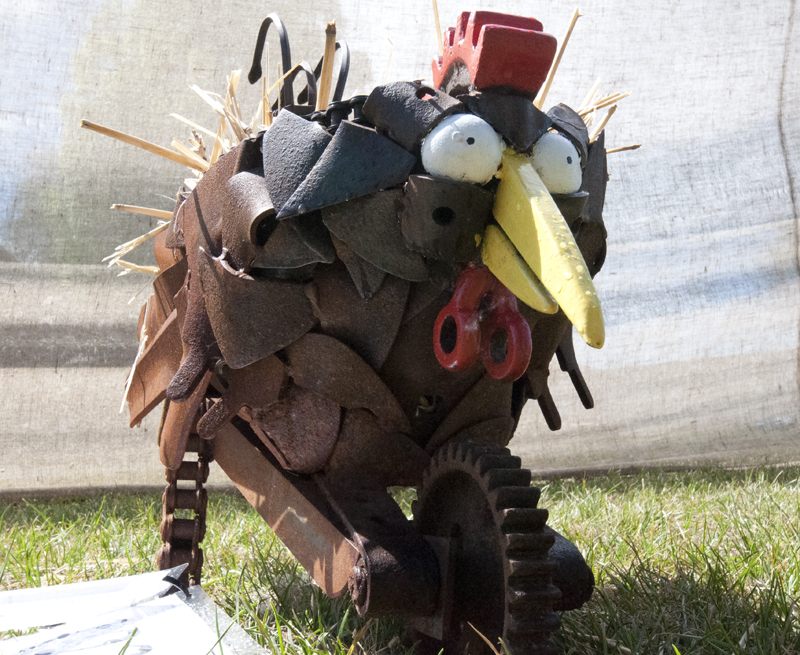 and an emu made out of old cars. 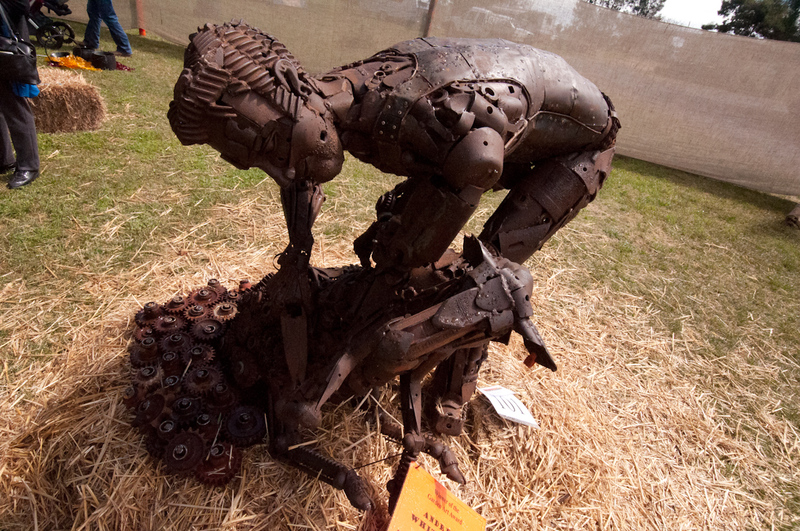 This iconic Australian sculpture wasn't part of the competition - it's the 2008 winner! 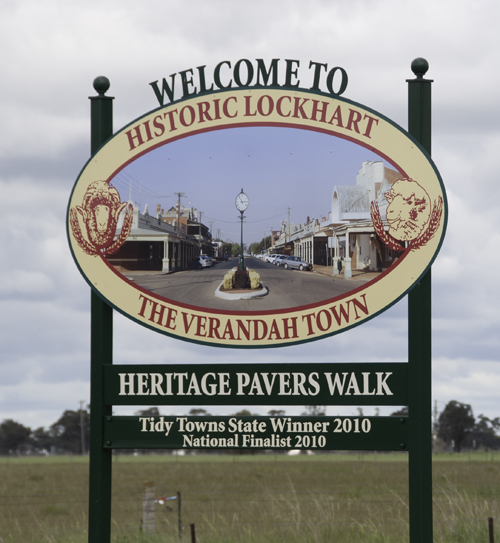 It is in the centre of Lockhart. 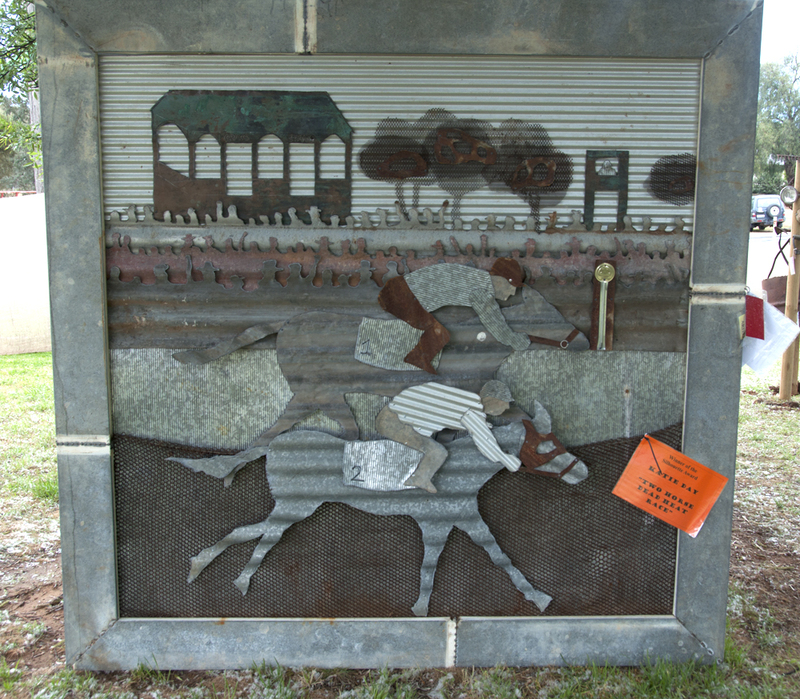 The 2010 winner, now on permanent display in downtown Lockhart. Lots of people climbed up for a photo beside the driver. 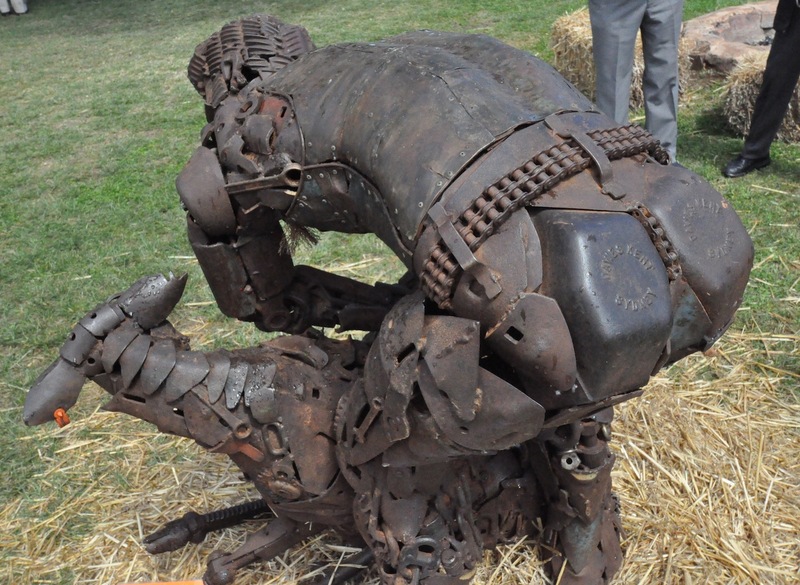 This got our votes for the People's Choice Award, a man riding a kangaroo. 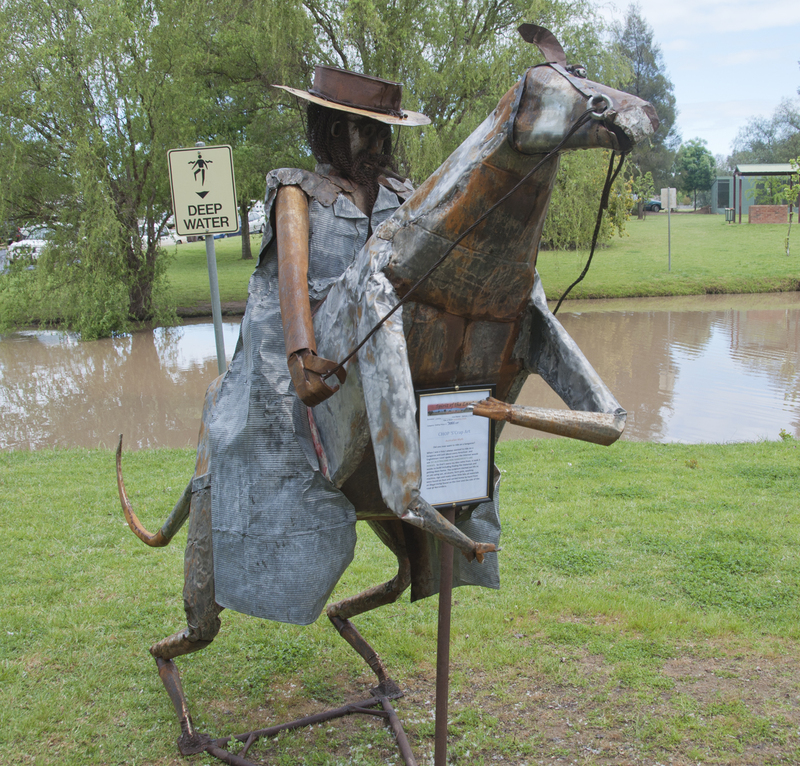 The artist said he was always asked, when he met foreigners, if Aussies rode kangas. Title: Australian Myth. Detail of kangaroo rider. This is by a guy who lost his job because he lost his license, so lost his job; he moved back to his home town, learned to weld at the shed, got a welder for Christmas, and carried home scrap he found on the roadside. Incredible story, and incredible art! Winner in the Silhouette Category. Nothing special. There's no photo of the overall winner because it was always crowded, but really it was no better, and not much different than, the 2010 winner above. This was the winner of the Garden Art category, and a clear audience favourite. After watching so much sheep shearing in Ganmain, we really appreciated it. 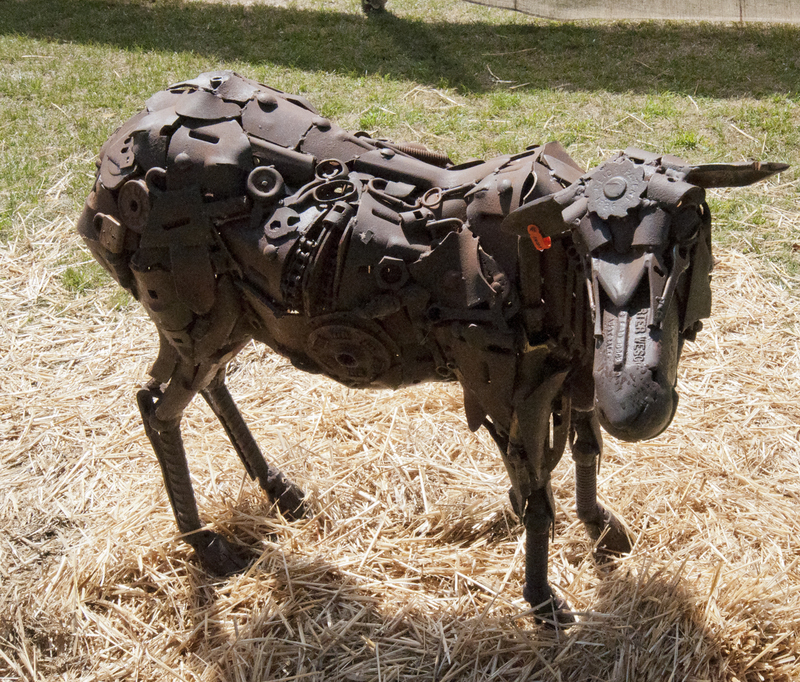 This is the second part of the sheep shearer sculpture - a sheared sheep. The little tag on his ear is even authentic. The attention to detail on this shearer is incredible. On the first picture, you can see a tattoo of a guitar (shearers wear singlets, so no sleeves). In this one, underarm hair! 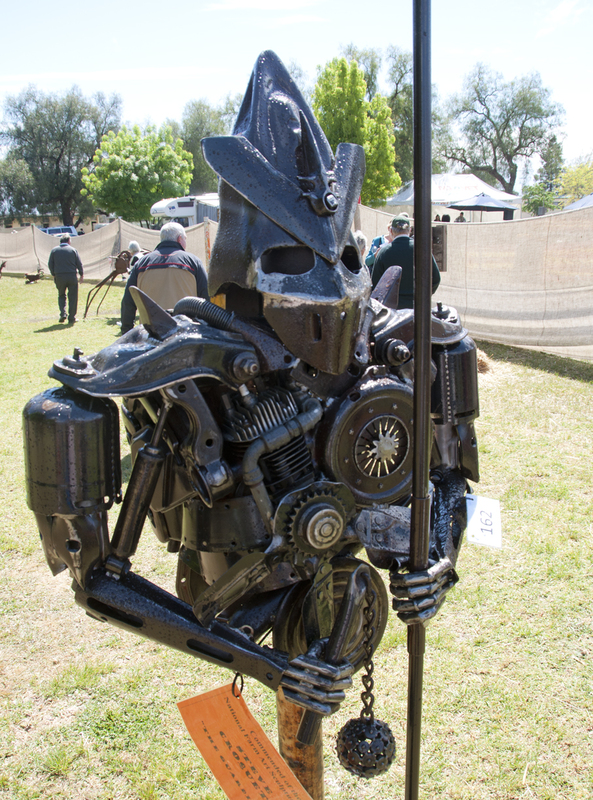 This is one of a pair of sentries at gate to the exhibit: a lawn mower engine, plow parts, and shock absorbers. Brilliant. This little guy was great. Probably designed to be a planter, he had a straw nest full of real eggs in his back for competition purposes. 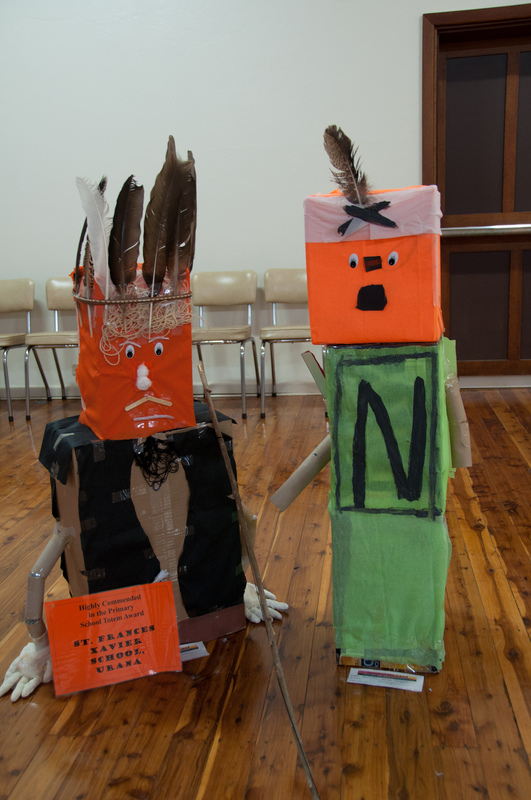 Every school kid in Australia wants to be Ned Kelly, every craft competition features many likenesses of him. This, however, is the first we've seen of him as an ice hockey goalie. 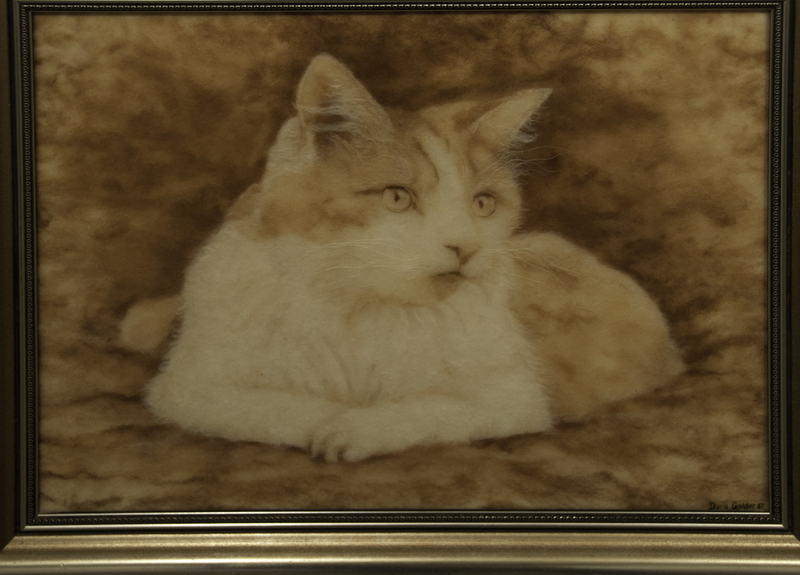 This is one of Doris Golder's pet portraits. Look closely at the detail - this cat has whiskers! Doris Golder is either a genius or crazy. 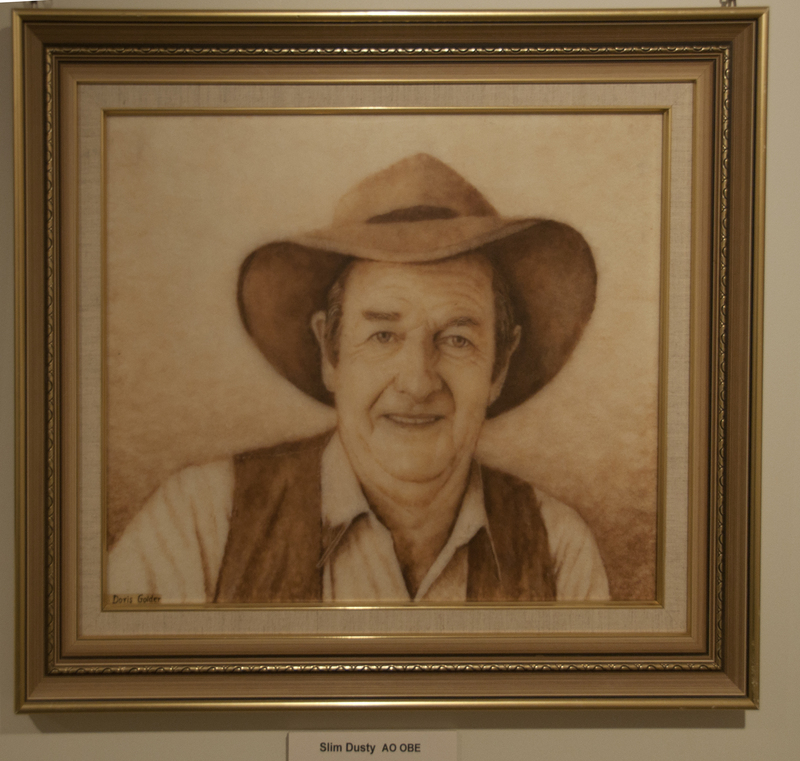 This is Doris' portrait of Slim Dusty. He's an Australian country & western legend. He recorded an album in Wagga! And we all know who this is. Sorry about the bad photo, the museum didn't allow photos so I took them secretly. This entry was posted in agriculture, art, citrus, festivals, Lockhart, museums, rural life, small town culture, Uncategorized, wool. Bookmark the permalink.